Supporters from around the world help Israeli businesses in Judea, Samaria combat 'anti-Semitic' BDS targeting of Israelis. Israeli President Reuven Rivlin met on Wednesday with representatives of an organization working to promote Israeli businesses in Judea and Samaria. The Lev HaOlam organization, which helps Israeli businesses operating in Judea and Samaria cope with ongoing efforts abroad to boycott or label their products, has built a network of supporters around the globe who are interested in promoting Israeli products from over the Green Line. The network spans a wide range of countries including China, the Netherlands, the US, Singapore, Australia, and Japan. President Rivlin took the opportunity to voice a strong condemnation of the Boycott, Divestment, and Sanctions Movement (BDS), calling the group anti-Semitic. "BDS is a clear expression of anti-Semitism which seeks to harm Israel and question its very existence." Rivlin also emphasized the importance of protecting not only business inside the Green Line, but of combating BDS campaigns targeting Israeli businesses in Judea and Samaria, saying the push efforts to halt. President Obama, however, has made a clear distinction between BDS efforts targeting pre-1967 Israel and those singling out Israeli businesses over the Green Line. Despite a new law barring US cooperation with BDS efforts targeting Judea and Samaria, Obama rejected “conflating Israel and ‘Israeli occupied territories,’” saying part of the newly passed law would “interfere with my constitutional authority”. The Lev HaOlam delegation included representatives from around the world. One participant, Arjenna Klaus from the Netherlands, said that the BDS efforts were an embarrassment, but did not reflect the feelings of all Europeans. “As a European I am deeply ashamed that again Jewish products are being labeled,” said Klaus. 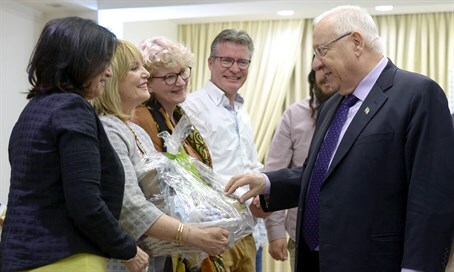 The delegations presented President Rivlin with products from across Judea and Samaria, including handmade jewelry from Shilo and Tekoa, chocolate and honey from the Hevron area, and cosmetics from Itamar.